In an expected result, Scotland finished off their dismal qualifying campaign in style with a 6-0 win over lowly Gibraltar matching their result in Glasgow. Not quite the end they were hoping for but all dreams of reaching France next summer died when they failed to see off Poland with only thirty seconds remaining. Dissecting what went wrong in this campaign has a strange familiarity to it. Like a path ventured down too many times, Scotland continues to present the same problems over and over. Plucky when the underdog, Scotland displays the passion for which they have become famous for. But passion hardly ever ends in points and for some bizarre reason that doesn’t seem to matter. It’s when we are supposed to be top dog that is the main concern, unable to cleanly dispatch the lesser nations of the Faroes Islands, Estonia and our new nemesis Georgia. But surely both are equally important. Qualification isn’t dependent on taking the scalp of a larger, more technical nation but it can’t hurt right? In this campaign when Ireland snatched four out of six points from Germany and ran Poland close in both of their meetings, why could Scotland not match or better that? Arguably they are a better team than their North Sea neighbors, even if you only base that on our two meetings with Ireland when Scotland took home four from six in terms of points. Why do they have the belief that they can get a result yet Scotland appears to not. There are a thousand excuses for why Scotland failed to beat Germany or Poland, everything from unfortunate deflections to better quality of players and the personal favourite – they simply lacked that wee bit of luck on the ball. Nonsense, all of it. In football anything can happen. Look at Greece who went from struggling to win a European Championship game to tournament winners in just a few matches. It’s eleven men vs eleven men, not David vs Goliath. Germany were strangely under par in qualifying and were there for the taking but Scotland lacked belief that they could actually do it. Even when they do score, blind panic sets in and Scotland fold like cheap deck chairs. They prefer to go behind and rally rather than take the lead and control. But time after time, taking the lead is a curse. This is what cost Scotland a qualification spot really, not dropping three points against Georgia. 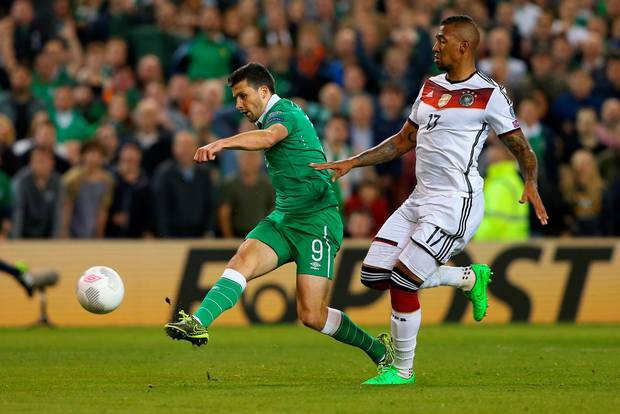 Shane Long fires Ireland’s winner against Germany so why couldn’t Scotland do similar? It doesn’t help that the entire team seems unconvinced by the defence. Once a staple of Scottish football, the defense looks less convincing by the day. Bremner, Greig, Hansen, Gough and Hendry have been replaced with middle of the road defenders, all of which are good but never great. Indeed Strachan only ever played the same back four twice in ten matches. 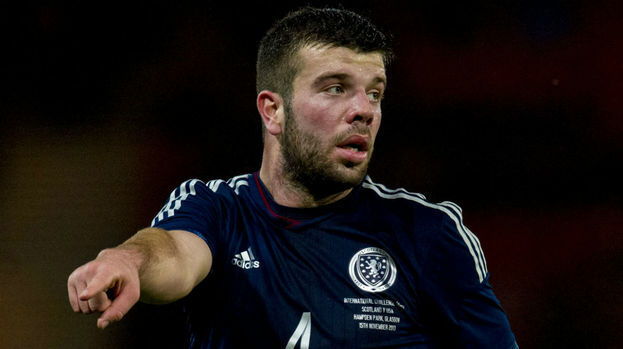 Leaky is not the word as Scotland shipped 12 goals in qualifying including Gibraltar’s first ever international goal. In comparison Wales conceded only four times as they qualified highlighting the real issue Scotland faces- they cannot defend. Makeshift left backs, rotating centre half, limited right backs and goalkeeper loyalty conundrums all plagued this campaign and ultimately cost Scotland qualification. Being tight at the back can be the difference between winning and losing, stopping the opponents from scoring then nicking a goal at the other end to secure an unfavorable 1-0 win. Scotland did it in the past against France (twice), Holland and England despite being under a barrage of pressure for the entire ninety minutes. Both in Scotland and in Poland, the Scots had the lead before letting it slip. Six points instead of 2 may have been the difference between Scotland progressing to France 2016 and Poland staying at home to lick its wounds. So what is the solution? Perhaps following the NFL’s lead and appointing a defence coach who knows how to organize the back five and make them solid once more. Scotland could employ a permanent defensive midfielder to sit and cover the back line but again without coordination this move would be limited. There is a nucleus of players there to work with but the need structure and guidance if they are to be successful. Fresh blood is often what is needed but the lack of talent coming through is a concern however this is hardly a new problem for Scotland or indeed most countries of our size like Northern Ireland or Wales. Good players can become great if deployed correctly and possess the belief needed to succeed. Scotland have just under a year now to regroup, refocus and go again before the World Cup qualifiers kick off. That should be enough time to sort of Scotland’s defensive frailties and reestablish the passion and belief needed to help them qualify.